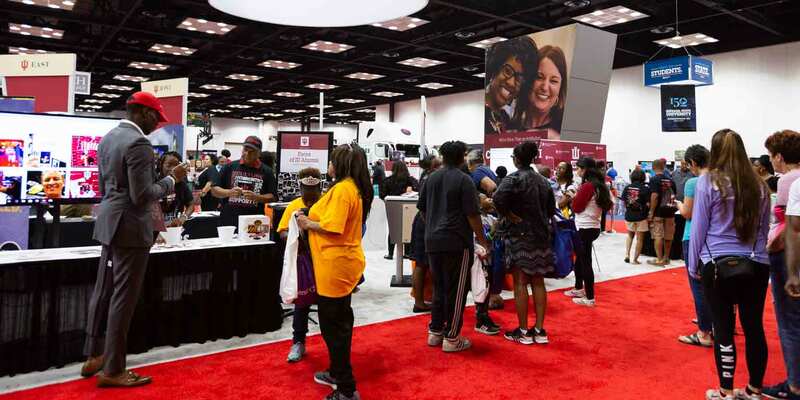 When Bradley Eldridge and his mother visited the Indiana University booth at the 2018 Indiana Black Expo Summer Celebration, college affordability was at the front of their minds. Though Eldridge, a high school sophomore and 21st Century Scholar, was still a few years off from attending college, he was already clear-eyed about the impact that a degree could have on his future. Making such positive outcomes possible was a key focus of Indiana University’s presence at the Summer Celebration. 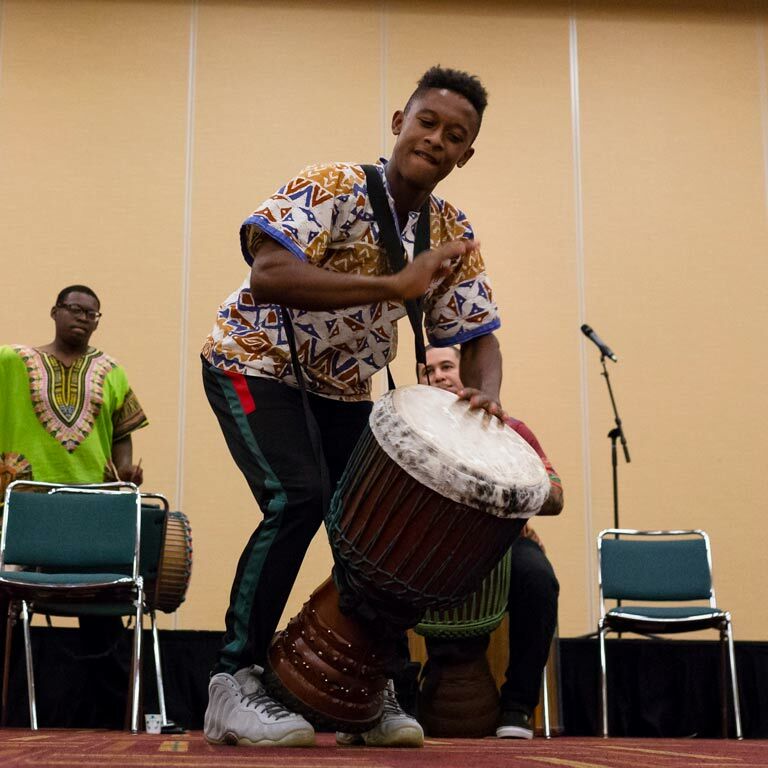 The weeklong event, held in downtown Indianapolis, featured several IU-sponsored events, including the 11th Annual Education Conference and the Pacers Sports and Entertainment Corporate Luncheon, the largest event of its kind in Indiana. 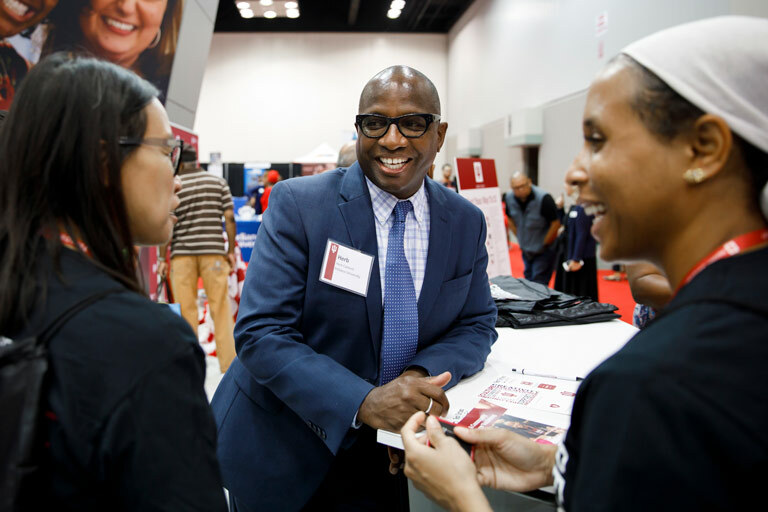 The celebration culminated in the weekend-long Exhibition Hall, where over 200 IU volunteers met with students and provided information on everything the university’s seven campuses and two regional centers have to offer. Through it all, Indiana University emphasized that, with programs like the 21st Century Scholarship, getting an affordable college education has never been more attainable, especially for students from historically underrepresented communities. First implemented by the Indiana Commission for Higher Education in 1990, the 21st Century Scholars program offers low-income Indiana residents a path to an affordable college education. Along with college planning resources, scholars who complete the program are able to receive a four-year, full-tuition scholarship to any eligible Indiana university. This year, more than 1,100 21st Century Scholars signed up to fulfill their requirements at the IU booth during the exhibition weekend—an all-time record for the university. “This is the largest number [of 21st Century Scholars] that have signed up saying they were coming, so I’m very pleased,” said Vincent Isom, Director of the 21st Century Scholars Program at IU Bloomington. 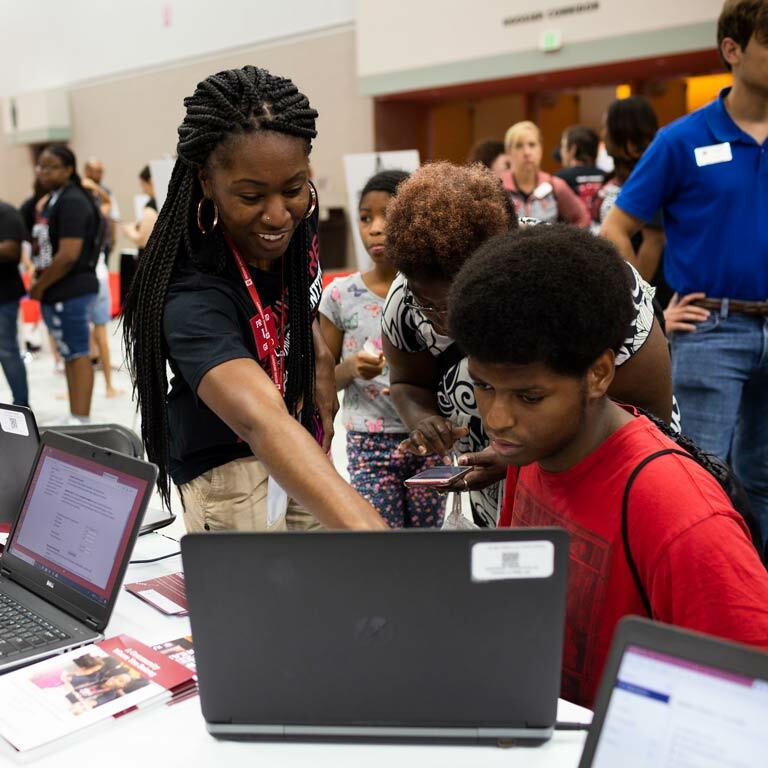 Though the 21st Century Scholars program was the focus of the weekend, it was far from the only activity going on at the Indiana University booth. In some corners of the booth, IU alumni reconnected with friends and left written messages of inspiration posted for students near the entrance. In others, visitors posed at the IU photo booth, took virtual tours of the campuses, and donned a virtual reality headset to explore a hologram display. Near the center of the booth, families gathered around tables where volunteers from the Indiana Commission for Higher Education answered questions and helped scholars update their progress online. Throughout, volunteers stressed the importance of scholars exploring their options and completing their requirements on time. On the last day of the exhibition, Janel Johnson was one of the many parents waiting in the booth as their children met their deadlines. Johnson’s daughter, Ali, a quiet girl in a long, hooded sweatshirt, worked on her 21st Century Scholar requirements at a computer a few feet away. Like many of the parents at the booth, Janel was concerned about the financial logistics of her daughter’s education. But she also wanted to make sure that Ali, a musician and artist, can pursue the path most fulfilling to her.